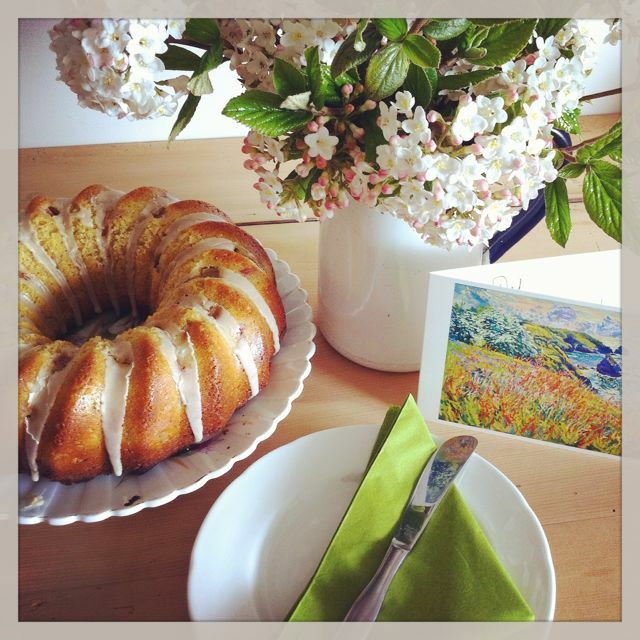 As it was a beautifully warm spring day, a light seasonal cake seemed appropriate. I had the first of my mother’s rhubarb raring to go and the last of my Spanish oranges. Rhubarb pairs particularly well with both orange and ginger I’ve found. In my pre Chocolate Log blog days, I used to make a rather gorgeous rhubarb and ginger cake, but it’s quite heavy on the flavouring and more of a cold day bake. Rather than use lots of ginger in the sponge, I thought a gingery glaze would do the trick instead. I used the rest of the rhubarb to make these rhubarb and rose waffles, which were a real winner. The birthday boy was delighted with his rhubarb bundt cake and we all had a slice after a hearty bowl of soup for lunch. It turned out just as I hoped and was lightly fruity without being stodgy. Bursts of tart rhubarb exploded on the tongue and the touch of hot spiciness from the ginger glaze made a welcome contrast. It set us up very nicely for our afternoon walk where spring flowers abounded. Magnolias are always splendid at this time of year in Cornwall but yellow ones are a little more unusual. We refuelled at the Duchy Nursery cafe where it was warm enough to sit outside and enjoy the picturesque views of Restormel Castle and the Fowey valley below. My kind of day. This rhubarb bundt cake may not be a particularly brightly coloured cake, but it is flecked with pink from the rhubarb and has a gingery coloured icing, so I am sending it to Love Cake over at JibberJabber UK, where the theme this month is Colour Me Pretty. Thanks for visiting Tin and Thyme. If you make this rhubarb bundt cake, I’d love to hear about it in the comments below or via social media. Do share a photo on social media too and use the hashtag #tinandthyme, so I can spot it. For more delicious and nutritious recipes, follow me on Twitter, Facebook, Instagram or Pinterest. A deliciously moist cake with a good crumb structure which cuts well. Flavoured with tart rhubarb and orange and drizzled with a hot ginger glaze. Grate in the orange zest and beat some more. Gently mix in the yoghurt and orange juice until just combined, then stir in the rhubarb. Spoon the batter into an oiled silicone bundt mould or tin. Bake at 180°C for about 40 minutes or until the cake is well risen and an inserted skewer comes out clean. Allow to cool for 10 minutes, then turn out onto a wire rack to cool completely. Mix the icing sugar and ginger with just enough water to make a slightly runny icing. Drizzle over the cooled cake. The cake cuts into 8 large slices or 16 moderate ones. This is wonderful Choclette. I am not that familiar with rhubarb but I love its taste. Very nice with yogurt and almonds too! No Alida, rhubarb is not something I associate with Italy. You are right though, it is delicious with yoghurt and almonds. You should try it out in a cake. Thanks Margot, it’s a classic combination, but such a good one. What a beautiful bake! I could quite happily tuck into this any time of the day! Love the ginger glaze idea too – pinned to try later! Mmmmm this looks delicious. Rhubarb an ginger is one of my all time favourite flavour combinations. I want! Anything with rhubarb in the recipe has my vote. It looks delicious. I’m with you on that one Anita-Clare – thank you. Delicious! I go crazy for rhubarb! Do you ever manage to catch any on your travels Rachel? how gorgeous… I love the icing wedged into the grooves… beautiful! What a gorgeous looking cake and a great idea – I really have a taste for rhubarb at the moment. I know what you mean Laura. Luckily it’s the season for it – hooray. 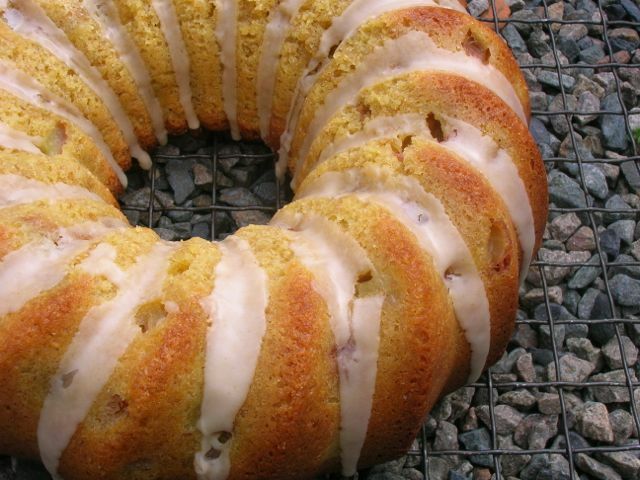 I have yet to try Rhubarb or Bundt cake so would love to test this one out. Don’t let the year go by without this changing Bintu, especially a rhubarb cake which is one of the very best. I adore rhubarb in cakes and this looks a real stunner. Love the flavour combination with orange and ginger too – just perfect for a lovely spring day. Thanks Vanesther. Strangely I wasn’t at all keen on rhubarb as a child, love it now. Of course it might have been a bit different if I’d had it in cake form. Thank you Alison, rhubarb works fabulously well in cakes. What a gorgeously textured looking bundt! And the flavour combination sounds delicious. I love rhubarb with ginger and orange is definitely one of my favourites right now. I can see why this went down so well. The magnolias are perfect right now aren’t they?! I love the idea of this cake with the rhubarb in and the ginger glaze. Rhubarb is one of my favourite flavours it’s just such a shame it’s only around for a short time. Thanks Corina, I used to dislike rhubarb as a child. Now I can’t understand why. What a lovely combination with the seasonal rhubarb, ginger and orange. I love Bundt cakes and this is so different to usual recipes. Thanks Ness. I think next time I would put more rhubarb in, but other than that, it was a really good cake. This looks gorgeous and sounds delicious. Rhubarb, orange and ginger together, heaven! Thanks for the recipe, I shall try this one! Good to hear from you Jean. This cake was a really good one, but I think it could have done with a bit more rhubarb. You might want to bear that in mind if you do make it – depends how much you like rhubarb I guess.